Merced, CA (September 7, 2018) -The surf performance of the new ZS Series from Supreme Boats is apparent at first sight. The 23-foot 2-inch ZS232 and the 21-foot 2-inch ZS212 look like high performance wake surfing boats because they are. Supreme named these new 2019 models ZS for the Z-shaped sheer line, but they are known as the Zeus 23 and 21 internally for their powerful trinity of surf, strength and spirit. The spirit of the wide bow, Z-shaped shear line, raked stance and chiseled body lines will stop you in your tracks while the deliberate shape of the new running surface will literally move you. 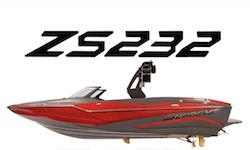 The ZS232 and ZS212 wear competitive spirit on the outside, these Supreme boats bring out the competitor in you. Whether you are being pushed by the ZS Series’ powerful surf wave, launching off of the wakeboard wakes or comfortably cruising the lake on a rough day, this Supreme Series helps you enjoy your ride. As much as 4600 pounds of ballast displaces this Tapered-V Hull for bigger waves and more fun. The strength of a Supreme boat comes from the extra steps of Vacuum Infusion and Unibody Construction. These production processes join Supreme Power by GM Marine to create the quietest ride. Let us prove the surf, strength and spirit of the 2019 ZS Series to you on the water. Enjoy your ride with Supreme boats.